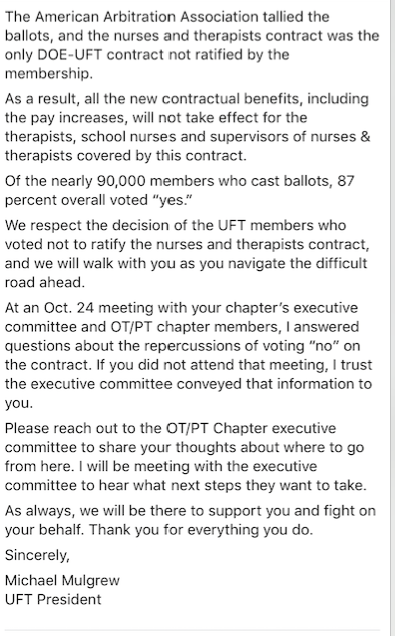 UPDATE - Monday - OT/PT Chapter Leader urged YES Vote. Unity Caucus usually controls the functional chapters so this is not surprising. Sunday 3:30 PM Update - I'm reposting the 1:30 with an update. 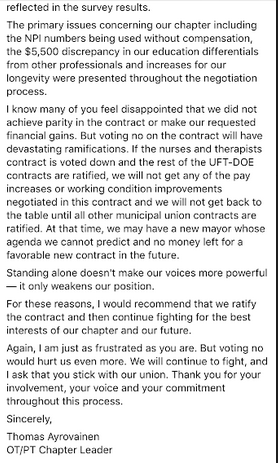 The OT/PT, nurses unit rejected the contract. I think the leadership will try to punish them for rejecting the contract by letting a lot of time pass so they will be not get any raises. That'll learn em for saying NO. The more I look at Mulgrew's letter, the more furious I get. "You just screwed yourselves, but we will stand beside you. While you screw yourselves." Solidarity forever. OTs and PTs were furious that they didn't get a fair pay increase, pedagogical status, or recognition of enough paid hours to qualify for FMLA. Apparently they went to sleep the night before the tentative agreement being assured they'd get some combination of the above things. When asked about the betrayal at the October DA, Mulgrew tepidly responded by saying something like, "Well, the DOE didn't want to talk about any of that." The attached letter, that just went out to the OT/PT & Nurses chapter, is a classic example of passive-aggressive, supportive-but-actually-not-supportive, chastisement. Very disturbing. There was some back and forth on the para contract, which I'm sure was overwhelmingly ratified. James Eterno sent me his position on the para contract and why he thinks despite due process it was not a good deal for them. Paraprofessionals winning better due process is all well and good from their contract which is a totally separate contract from teachers. The UFT has many distinct bargaining units. What about paraprofessional pay? They too are receiving paltry salary increases so that the starting salary for paras will be $28,448 a year in 2021 in this contract. In NYC that is basically subsistence wages for paras. That is less than half of what a starting teacher makes. Another non-teacher chapter in the UFT isn’t catching up with teacher salaries either. Occupational-physical therapists are not anywhere near pay parity with teachers and these professionals have advanced degrees. That is an outrage that has not been addressed. In addition, guidance counselors, school secretaries and other non-teaching titles did not get an arbitration provision in their workload dispute complaint procedures so administrators are free to just pile on the work and the dispute is never heard by an outside neutral party. Most of the non-teacher UFT contracts are not any better than the teacher deal. Because the paras have better due process, it is no reason to say yes to the teacher or guidance counselor or any other of these UFT contracts. Will Some NOs opt out? I also got some feedback from the earlier post -- like if there are over 15,000 people who voted NO, does that make them candidates to use Janus to opt out of the union in June? I will explore what this all might mean for the opposition that led the NO campaign. 80% of the teachers is a victory of sorts. How much did Eterno and MORE move the NO needle? Imagine if there were NO people in 300-500 schools. That they aren't far from being in triple figures after all this time is indicative of the glacial rate of organizing. In fact there has been shrinkage -- glacial organizing retreat. Still, if the number comes in at 80%, given that in 2014 it was less than 10% points lower among teachers, this is not the kind of +90 wave we thought we might be seeing. Sketchy report from UFT event at the Hilton. Not as high as we expected but higher than in 2014. We’ll do some analysis on what it may mean in terms of the NO vote campaign and the future UFT election in a few months. By the way, I heard some birdies say that Mulgrew wants to push the election up from when they held it last time, which makes sense to capitalize on the contract numbers ASAP and also to stay away from the late spring when the window opens up to opt out due to Janus. I keep asking the others in the opposition about the point of putting so much effort into a dead end election. First build up a network of a few hundred schools. Clearly many of the NO votes came from schools where there was an active NO network. Given how few schools the entire opposition are based in, these votes - say as an estimate - 12-14,000 teachers — is not insignificant in terms of building a network. The opposition must go out and find them and organize them, something it has not been able to do - witness 2014 when higher numbers voted NO. I voted no (I’m a teacher) and I’m not going to opt out. A lot of people voted no and have no plans to opt out. Most people I know who voted No was because of healthcare.